For the Dr. Martin Luther King, Jr. holiday: “Beyond Vietnam” | Fight Back! The truth of these words is beyond doubt but the mission to which they call us is a most difficult one. Even when pressed by the demands of inner truth, men do not easily assume the task of opposing their government's policy, especially in time of war. Nor does the human spirit move without great difficulty against all the apathy of conformist thought within one's own bosom and in the surrounding world. Moreover, when the issues at hand seem as perplexed as they often do in the case of this dreadful conflict we are always on the verge of being mesmerized by uncertainty; but we must move on. I am convinced that if we are to get on the right side of the world revolution, we as a nation must undergo a radical revolution of values. We must rapidly begin the shift from a "thing-oriented" society to a "person-oriented" society. When machines and computers, profit motives and property rights are considered more important than people, the giant triplets of racism, materialism, and militarism are incapable of being conquered. Since I am a preacher by trade, I suppose it is not surprising that I have seven major reasons for bringing Vietnam into the field of my moral vision. There is at the outset a very obvious and almost facile connection between the war in Vietnam and the struggle I, and others, have been waging in America. A few years ago there was a shining moment in that struggle. It seemed as if there was a real promise of hope for the poor -- both black and white -- through the poverty program. There were experiments, hopes, new beginnings. Then came the buildup in Vietnam and I watched the program broken and eviscerated as if it were some idle political plaything of a society gone mad on war, and I knew that America would never invest the necessary funds or energies in rehabilitation of its poor so long as adventures like Vietnam continued to draw men and skills and money like some demonic destructive suction tube. So I was increasingly compelled to see the war as an enemy of the poor and to attack it as such. O, yes, I say it plain, America never was America to me, And yet I swear this oath-- America will be! In 1957 a sensitive American official overseas said that it seemed to him that our nation was on the wrong side of a world revolution. During the past ten years we have seen emerge a pattern of suppression which now has justified the presence of U.S. military "advisers" in Venezuela. This need to maintain social stability for our investments accounts for the counter-revolutionary action of American forces in Guatemala. It tells why American helicopters are being used against guerrillas in Colombia and why American napalm and green beret forces have already been active against rebels in Peru. It is with such activity in mind that the words of the late John F. Kennedy come back to haunt us. Five years ago he said, "Those who make peaceful revolution impossible will make violent revolution inevitable." A true revolution of values will soon cause us to question the fairness and justice of many of our past and present policies. On the one hand we are called to play the good Samaritan on life's roadside; but that will be only an initial act. One day we must come to see that the whole Jericho road must be transformed so that men and women will not be constantly beaten and robbed as they make their journey on life's highway. True compassion is more than flinging a coin to a beggar; it is not haphazard and superficial. It comes to see that an edifice which produces beggars needs restructuring. A true revolution of values will soon look uneasily on the glaring contrast of poverty and wealth. With righteous indignation, it will look across the seas and see individual capitalists of the West investing huge sums of money in Asia, Africa and South America, only to take the profits out with no concern for the social betterment of the countries, and say: "This is not just." It will look at our alliance with the landed gentry of Latin America and say: "This is not just." The Western arrogance of feeling that it has everything to teach others and nothing to learn from them is not just. A true revolution of values will lay hands on the world order and say of war: "This way of settling differences is not just." 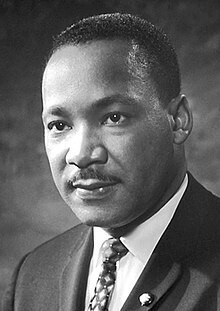 This business of burning human beings with napalm, of filling our nation's homes with orphans and widows, of injecting poisonous drugs of hate into veins of people normally humane, of sending men home from dark and bloody battlefields physically handicapped and psychologically deranged, cannot be reconciled with wisdom, justice and love. A nation that continues year after year to spend more money on military defense than on programs of social uplift is approaching spiritual death. This kind of positive revolution of values is our best defense against communism. War is not the answer. Communism will never be defeated by the use of atomic bombs or nuclear weapons. Let us not join those who shout war and through their misguided passions urge the United States to relinquish its participation in the United Nations. These are days which demand wise restraint and calm reasonableness. We must not call everyone a Communist or an appeaser who advocates the seating of Red China in the United Nations and who recognizes that hate and hysteria are not the final answers to the problem of these turbulent days. We must not engage in a negative anti-communism, but rather in a positive thrust for democracy, realizing that our greatest defense against communism is to take offensive action in behalf of justice. We must with positive action seek to remove those conditions of poverty, insecurity and injustice which are the fertile soil in which the seed of communism grows and develops. We are now faced with the fact that tomorrow is today. We are confronted with the fierce urgency of now. In this unfolding conundrum of life and history there is such a thing as being too late. Procrastination is still the thief of time. Life often leaves us standing bare, naked and dejected with a lost opportunity. The "tide in the affairs of men" does not remain at the flood; it ebbs. We may cry out desperately for time to pause in her passage, but time is deaf to every plea and rushes on. Over the bleached bones and jumbled residue of numerous civilizations are written the pathetic words: "Too late." There is an invisible book of life that faithfully records our vigilance or our neglect. "The moving finger writes, and having writ moves on..." We still have a choice today; nonviolent coexistence or violent co-annihilation.